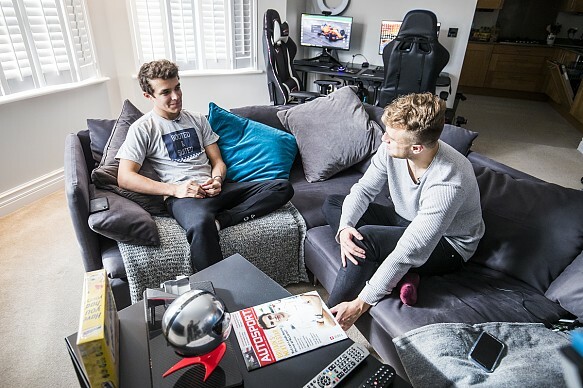 From the outside, Lando Norris's Guildford flat looks more 'suburban normality' than 'Formula 1 driver's mansion'. But inside it's a world of simulators that look like they've been lifted from the flightdeck of a spaceship, piloted by a young man who feasts on Weetabix, and salad cream on pizza. There's never a dull moment in the life of Lando Norris. Raised in Glastonbury near Bristol, Norris shot to fame last year when it was announced that he would join McLaren for the 2019 F1 season, having just turned 19. 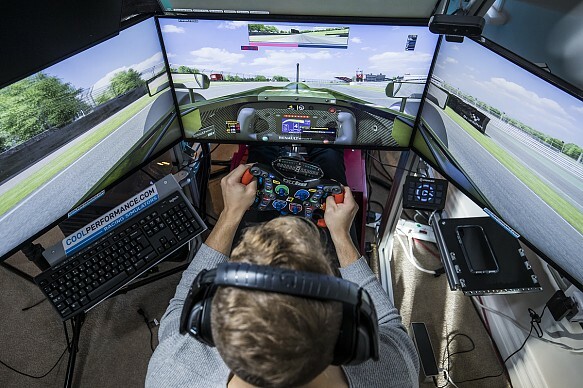 Behind that journey is one common factor that's anchored his progress throughout his five - yes, just five - years of racing cars, and that's his simulator. An entry foyer lined with shoes - around 10 yards of trainers organised from light to dark in colour - leads into a main room that appears almost normal; a dining table and chairs, a big TV, a fireplace and big bay windows, with taupe carpets from wall to wall. It's not your stereotypical teen pad, even more so thanks to the part we haven't got to yet - the two massive simulators positioned just in front of the lounge door, which would be the cause of massive envy for any self-respecting motorsport fan. Norris's set-up is made by Pro-Sim - a company run by GP2 race winner Adrian Quaife-Hobbs - but of course his rig is that little bit special. As well as the adjustable pedals that come with each unit, there are three screens, and a personalised light-up steering wheel with his logo in the middle, looking like it belongs in a 1950s sci-fi movie. And what has gone on at this seat is pretty out of this world too... Asked if he ever wakes up and feels like he's missing out by not being on the sim, Norris is blunt. "My life is pretty much this, on the sim," he says. "It's the biggest thing I enjoy in life. Maybe I spend too much time on it! I think I'm probably one of the most active users. The seat time in there is days! I need to have a timer." For drivers coming through the ranks, it's essential to have sim experience. This is the result of two major factors. The first is that most championships place restrictions on testing to keep costs down, massively increasing the importance of simulators, which go some way to making up for the limitations on seat-time. Secondly, F1 teams rely on the data produced from their own sims so heavily that changes are made to the cars on F1 weekends based on suggestions from back at base. This is known as 'race support', where test and simulator drivers - the role Norris occupied at McLaren this year - will immerse themselves in the timezone of whichever grand prix the team is operating in and log countless laps trying different set-ups to improve areas where the race drivers are struggling. It's a process that has become hugely important in F1. For instance, during the Canadian Grand Prix weekend a change suggested by Antonio Giovinazzi back in Maranello helped transform Sebastian Vettel's Ferrari for qualifying. The preparation for Norris starts right here, in his flat. When suggesting changes to the race team, he has to understand what that's going to do to the car, how it affects performance, and that decisions are being made independently of how quick his lap times are. It's a complex and involved process. 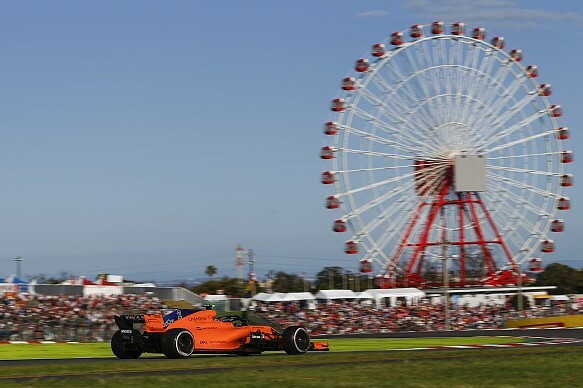 "When it's race support, if it's something like Japan, I had to be in the factory at midnight and finished around five in the afternoon," says Norris of the Suzuka weekend. "That's tough. 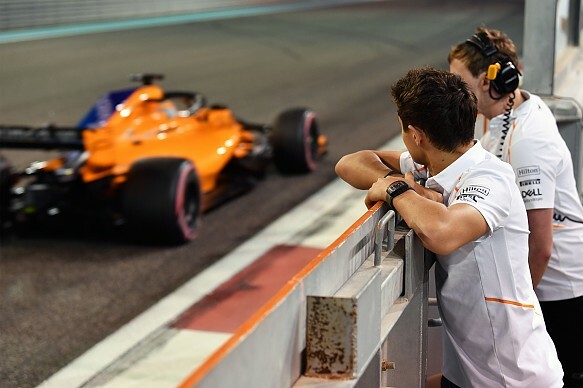 You need to be giving feedback to the McLaren engineers, who are relaying your info back to the track, and you want to be able to say there's something wrong or right without worrying about making a mistake. "On the sim at home, you can change downforce levels, roll bars, springs, rideheights - you can try all these different things. "On the RFactor model that comes with the Pro-Sim, everything is balanced and measured. If you go up on the rear rideheight, for example, it changes the airflow and the downforce of the car. You learn by trying different things, which gives you a better idea when you're on a race weekend." If the day is not spent on the home sim, he'll be at McLaren or Pro-Sim's headquarters in Sevenoaks. Before each race in Formula 2 - in which Norris finished runner-up to new Williams signing George Russell this year - he'd head to Pro-Sim to test. Sometimes it's not as much about pumping in benchmark laps as competing against Carlin F2 team-mate Sergio Sette Camara. Both Norris and incoming McLaren junior Sette Camara can record data on their home sims and send it in to Quaife-Hobbs - himself a former McLaren GT factory driver - to process. Each driver can see where the other is quicker, allowing both to improve. "It's good as we're able to go on track together, race against each other and push each other," Norris says. "We go with our engineers, so we can give better feedback to Adrian on changing gear ratios or grip levels. It's really good how accurate we can make things. It's not just about data though - Sergio and I can race, see where there's overtaking opportunities on track and generally try things so that we are as prepared as possible." He can also do this at home, thanks to the fact that he lives with Sacha Fenestraz, who won the Formula Renault Eurocup in 2017, one year after Norris. Frenchman Fenestraz was until recently part of the Renault junior academy, and is hoping to reach the same dizzying heights as his flat-mate. The simulator just by the door is his, and I can have a go on it later. Fenestraz, who has been called away on a family emergency, does have an F1-style steering wheel, which seems a bit bulky, but each to their own - as long as the performance is representative, the steering wheel doesn't matter. "I think I'd get bored on my own, so it's good to have him around," adds Norris. "It's good because we push each other. I might not want to train and he'd say, 'Come on, we have to.' I think it's mainly that way around! "We race each other on the sim, which is fun, and we can relate to each other. It's not like I have a room-mate who doesn't have a clue about what I'm doing. It has its perks and it has its downsides- altogether he's a cool guy and I enjoy sharing the place with him." We move over to the L-shaped sofa to chat about his sim. For Norris, complete dedication to training on his rig has been fundamental in his journey to the top. He's spent most of his life using them. In fact his brother Ollie has a company called Cool Performance, which sells the simulators, creating a perfect loop between him and Quaife-Hobbs. While physical workouts are obviously important to his preparation, Norris's skills have been honed by constant repetition on the sim. It's not uncommon for him to log five, six or even more hours per day on a sim, laying the groundwork for his F1 appearances this year. Handed two FP1 outings at Spa and Monza to audition for a race seat with McLaren, Norris passed with flying colours. Neither instance lit up the timesheets, but that's not what impressing in testing is about now. A little over a decade ago, when teams could run a third car on Fridays, pumping in rapid lap times got Sebastian Vettel, Robert Kubica and Anthony Davidson noticed on the big stage. But now it's as much about a driver's consistency in the simulator, the quality of their feedback and the effort put in with the team - all out of the limelight. This raises a pertinent question. 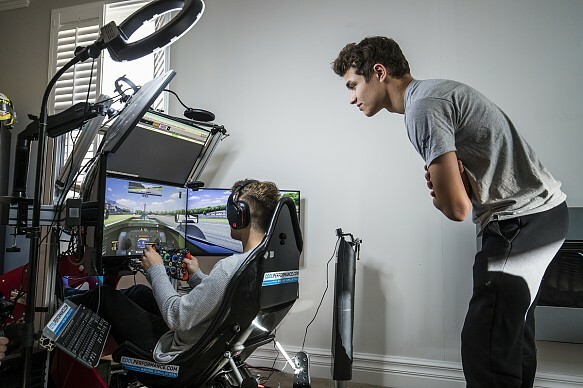 With the amount of time the new generation of drivers spend on the sim, are they mature enough to cope with being beaten by a team-mate, deal with an underperforming car, entertain team sponsors and keep their head when thrust into the global media spotlight? Norris has been surrounded by a team of people for almost his whole career, starting with ADD Management run by Mark Berryman, who is always in the back of the pits at race weekends. Given Norris's still tender age, you would expect that everything has been decided for him by ADD, but that's not always been the case. He may not come across as particularly assertive, but Norris is absolutely his own person, mature beyond his years and more than capable of making tough decisions. That's evident from the unconventional path he's taken to the top. 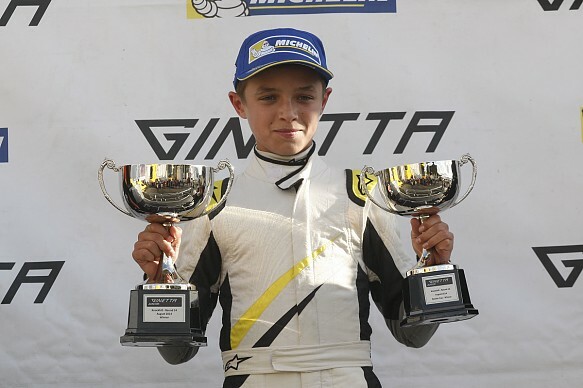 The decision to begin his car-racing career in Ginetta Juniors in 2014 alongside his final season in karting - in which he won the CIK-FIA World KF title - was a deviation from the traditional route to single-seaters, but delivered third in the championship and meant the then-14-year-old gained experience of the tracks he would race on during the following year in MSA Formula, now British F4. 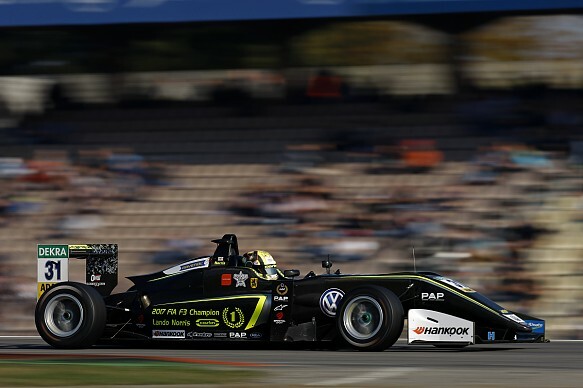 After cleaning up in his first season in single-seaters with Carlin, he followed it up with the Formula Renault Eurocup title - a rare feat for a rookie - driving for Josef Kaufmann Racing, added the FR Northern European Cup and Toyota Racing Series accolades the same year, and then swept to the European Formula 3 crown in 2017 with Carlin. F2 this year was just the latest step on a meteoric rise up the ladder, and he's more than happy with where it has led him. "There's a lot of things I could have done differently; F4 in Italy or Germany, for example [he contested part-programmes in both series in 2015]," Norris reflects. "I've done different things to most people and that's all down to [ADD] -they've advised me on everything, especially in the early part of my career. Because of that I've put a lot of trust in them. "At the end of the day, if it has come down to [a choice between] two teams, it can come down to what I say. Maybe I was quicker with other teams, but at Carlin I felt more at home, more comfortable, knowing that we could make progress. Maybe another car was quicker, but I wasn't enjoying it as much. For my career, I wouldn't go racing if I didn't enjoy it. I still need to have my say, and not just get put with a team and get told to deal with it." 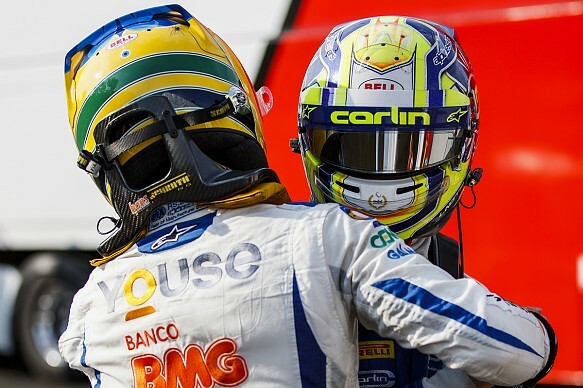 Norris's determination to enjoy his racing has resulted in him striking a formidable partnership with Carlin, claiming 22 wins, 53 podiums and 21 fastest laps along the way. Playing a key part is top engineer Stefan de Groot, an ex-Benelux Formula Ford champion who took a British F3 podium in 2002. He's been with Norris since the start in MSA Formula and the two have developed a strong bond. "We call him Doctor Laptime - that's his real name," jokes Norris. "He's not just helped me as a driver, but also given me lots of areas to improve on. He's always been great at describing what things do. Before 2015, I didn't know too much about cars. "He's able to explain things, what's going on in the car and why they are happening. That's helped me progress a lot as a driver and he was with me in F2 as well. "Carlin feels like home, the factory is 20 minutes down the road. They've helped me improve a lot, from someone who didn't know a lot about what went on or how a car worked. I'm interested in the car now - there's bits on my wall there, now I'm interested in the background of the car." Eyes move towards the wall near the entry foyer and some odd-looking shapes attached to the wall. On the left, a carbon wishbone. Unknown to many, Norris has volunteered for work experience at McLaren to learn more about the design process. As well as making sure to meet every member of staff, he wants to know how every piece of the car works to form the final package. That the items on his wall are the only racing-related objects on display underlines their importance to Norris. "Last night between seven and nine I went to meet all the night-shift crew. It's good that they didn't miss out on me!" quips Norris, who is still jetlagged from a recent trip to Mexico, where he logged more laps in FP1. "I've been doing work experience at McLaren - I've done eight days altogether now. It was my choice to go and do it - I got a carbon wishbone to put on my wall out of it. I like all of this stuff, it's interesting." Norris has passion in spades, but surprisingly it all started with motorbikes. 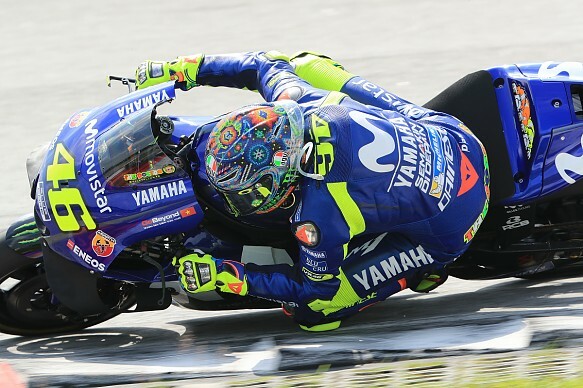 His first hero was Valentino Rossi, and the Italian rider's sun logo has been a mainstay on Norris's helmets throughout his career. A quad came first, then a motorbike. His father, Adam, has always had a keen interest in motorsport and had a spell working at Williams, but his aspirations to be a driver were frustrated by a lack of finance. "He then became a cyclist and has gone on and done different things, so a bit of the interest came from him," Norris explains. "Then I started playing Gran Turismo, my first racing game, and that's when it took off. My dad has been to every single race I've ever done bar three. He's committed. He's travelled everywhere, even New Zealand. My whole family has been supportive, not just my mum and dad but my sisters and my brother. I raced with my brother from when I started to 2014 when I finished karting." Norris hasn't had many low moments on the way up the ladder - he stated after the Silverstone F2 round, while leading the points, that his 2018 campaign was his worst season in racing to date - but admits that he has needed the support of his family and management while growing up in the spotlight. 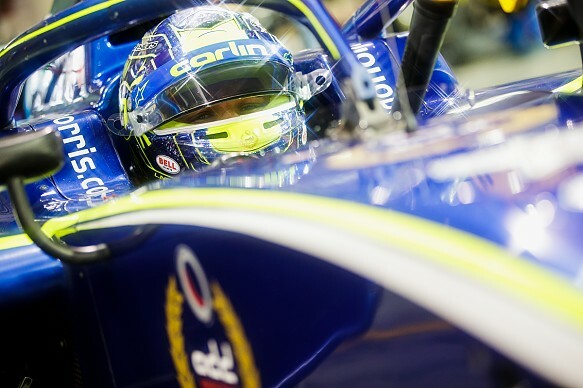 "I've had to make big decisions like leaving school, moving here to be closer to McLaren, and to Carlin," he says. "My mum didn't want me to move away, but my dad said it was for the best. "They have supported me and helped me to get to where I am now. It's been a long journey but they've stuck by my side. I don't get to see my family very often, because of days like this, and travelling, a lot of different things." Relaxed on his sofa, he's the image of a normal 19-year-old - albeit one who eats three Weetabix, three times a day. Norris has often been subjected to unfair accusations that he's not as outgoing as other drivers his age. But that simply isn't true, and behind closed doors, where he can relax, he's as witty as any of his peers. 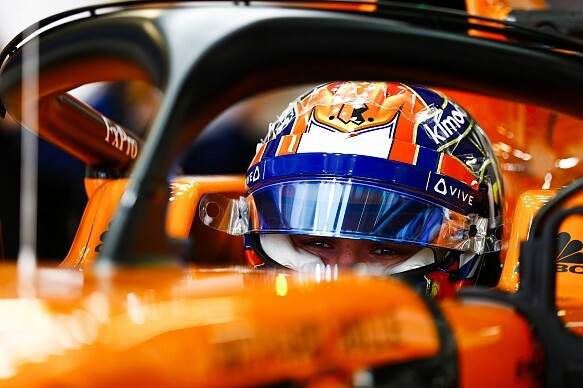 His love of social media proves as much, and he will continue to emerge as a personality that British motorsport can get behind as he settles into his new role with McLaren. He knows it will be tough, but he's done all the preparation possible. Now it's time to see it all come together in F1, and whether it will be enough to beat a team-mate of Carlos Sainz Jr's calibre. All that's left is to try out Norris's sim. I'm 6ft1in so it's not easy to get into, and there's suitable mockery from Norris. But once he's stopped taking the mick, he's a brilliant coach and I'm soon knocking tenths off my lap time around the Brands Hatch Indy circuit in a Formula Renault. You can witness his coaching skills on Autosport's YouTube channel, and see for yourself just how laid back this future Formula 1 star is. Imparting advice to Carlin's F3 young guns For a young man with the world in his sights, Lando Norris remains remarkably grounded. Within days of his McLaren deal being announced, he was off to the Nurburgring with Carlin to coach flat-mate Sacha Fenestraz and his FIA F3 European Championship team-mates Jehan Daruvala, Ferdinand Habsburg, Nikita Troitskiy and Ameya Vaidyanathan around the circuit where the year before he had claimed pole by a staggering nine tenths in the wet. Where most would be indulging in the achievement of a life-long dream, Norris was anxious to be back in the familiar environment of the racetrack. He had never coached before, but they say the best way to demonstrate understanding is to explain it to someone else. "It's different obviously from what I'm used to and it's good to see from another point of view and not just watching on TV," he says. "I wanted to come here anyway but more just to watch, have a weekend of enjoying myself and being at a racetrack but not doing loads of stuff. But at the same time I got asked if I could do what I could to help some of the drivers." Norris wasn't hands-on with set-up - "I don't think I'm at that kind of point" - but went out to watch on track and worked through the data with drivers to pass on his advice. How did he find it? "I don't want to sound like I've just come in here and talk like I know about what's right, what's wrong and what everyone should and shouldn't do," he replies. "It's just trying to help and give them a little bit of guidance." It's not every 19-year-old F1 driver that is quite so self-aware.